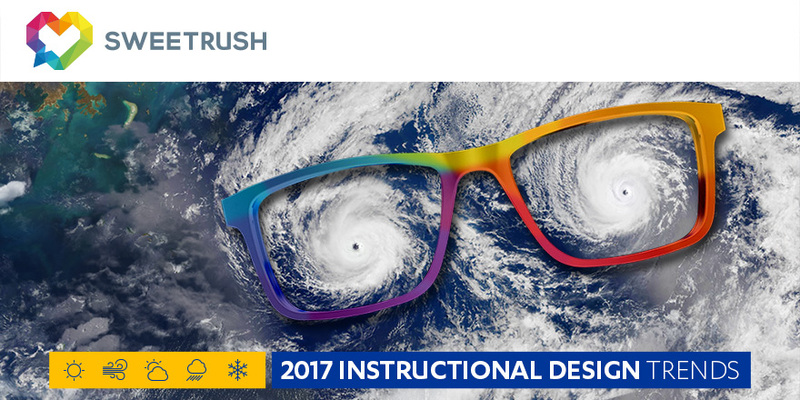 Six are the colors of the rainbow and six are the instructional design trends we highlight in our infographic below, based on SweetRush thought leaders’ predictions for 2017! These are the trends we see making an impact on the corporate training and instructional design this year, driven by learner and client demand, as well as outside trends in consumer marketing, advertising, gaming and more. This infographic is just the tip of the iceberg. Be sure to check out the complete article “2017 Instructional Design Trends Compass: Your Accu-Learningcast”, which provides more detail on each trend and resources for you to continue learning and move toward applying these trends in your craft. The forecast for 2017 is bright and we’re excited to help our clients bring these concepts to life! ? Now that you’ve got the highlights, check out the full article: “2017 Instructional Design Trends Compass: Your Accu-Learningcast.” Enjoy! Great insight! Visually engaging, highly creative and informative. Great job!